Experience an outstanding week of surfing and yoga at the Moroccan surfer’s paradise in Taghazout, Morocco, and refresh your mind, body, and soul. Find the pleasure of practicing yoga and surfing with all the good surf spots close by. Beginners, as well as advanced surfers and yoginis, are welcome. Yoga helps you to relax and find your focus, which will be a complement to your surfing skill. You will highly appreciate both important skills when you’re out in the water trying to catch waves. You will be accommodated in a traditional riad all single or double rooms with en-suite bathrooms and no shared bathrooms. All rooms are very welcoming and beautifully furnished in a traditional Moroccan style. There are many terraces which are great for panoramic views, chilling, reading a book, or chatting with your colleagues. Yoga lessons will be held on the beach as well as on the stunning rooftop terrace with a great view over the Tamraght and Taghazout areas. There is a pool at the patio of the riad. Upon your arrival, you will have a welcome reception with the owners Hicham & Nikki, you will have a briefing of the week's activities and a staff and program presentation. After breakfast, you'll take surf lessons with an instructor. In the afternoon, you are free to surf before you do a sunset yoga class late in the afternoon. You will have dinner at the riad. You will start your day with a yoga class followed by breakfast and surf lessons. Enjoy free surfing in the afternoon. Savor a barbecue dinner in the evening. In the morning, you will have a yoga class on the rooftop followed by breakfast and surf lessons. You will have an excursion to the souk of Agadir to buy local handicrafts and souvenirs. After surfing and yoga in the afternoon, you will have dinner at Taghazout. This morning, you and the group will have an excursion to Paradise Valley. 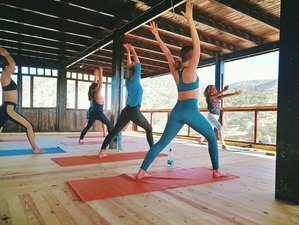 After the excursion, you will have a yoga session in the afternoon. Start your day with a morning yoga class on the beach followed by breakfast and surf lessons. Improve your skills with free surfing in the afternoon and a sunset yoga class on the rooftop, followed by a sumptuous dinner. This morning, you will have your final breakfast. Then, you'll bid farewell to your new friends. Hicham is originally from Kenitra, North Morocco, and started surfing when he was 12 years old. Since then his passion for watersports has grown more and more. Nine years ago, he started teaching professionally after having been approached by the Moroccan Surf Federation to become a fully qualified and certified instructor. As he started his career at an early age, he possesses a natural understanding of the ocean and the waves. Easy Surf Maroc is located in Tamraght, a beautiful Moroccan berber surf village which offers a relaxed atmosphere with beach front cafés and friendly locals. The most famous surf spots of Morocco such as Anchor Point, Killer Point, and Boilers are just a few minutes away from the camp. Morocco offers a prime location for the surf and yoga retreat with glorious sunshine, 300 days of sun annually, sandy beaches, and an endless coastline of surf spots for all levels. Daily breakfast, lunch, and dinner are included in the price. For the beach days, you will have packed lunch with fruits and cereals. All meals are prepared with local ingredients produced in the Tamraght or Taghazout areas. Vegan or other special dietary requirements will be provided on request with a little extra cost. Massages and hammam treatments can be booked at the camp, prices are between 20-25 EUR according to the treatment you choose. Please book your flight to arrive at Agadir-Al Massira Airport (AGA). The pick up from Agadir-Al Massira Airport (AGA) or Agadir main bus station is included in the package. If you will arrive at Marrakech Menara Airport (RAK), you can either be picked up by Easy Surf Maroc for 60 EUR per person (group of 2) per person (group transport) or travel by public bus. Individual taxi costs 120 EUR. Airport: Marrakesh Menara Airport Airport transfer available: Marrakesh Menara Airport (US$135 per person) Additional charges may apply. You can request this in the next step. Easy Surf Maroc offers unforgettable Moroccan yoga and surf holidays in a prime location for beginner, intermediate, and advanced surfers.